Recent efforts to steer theorizing about race and ethnicity in leisure in new directions are informed by the theory of planned behavior, social and cultural capital theories, and critical race theory. Several factors related to immigration may also constrain leisure participation. Sport participation has become a fixture in the lives of many Americans. From an early age, many people are engaged in or connected to various sporting activities in some fashion. 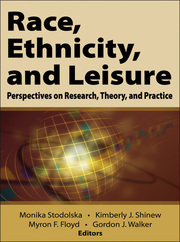 Race, Ethnicity, and Leisure: Perspectives on Research, Theory, and Practice provides an overview of the current theories and practices related to minority leisure and reviews numerous issues related to these diverse groups’ leisure, including needs and motivations, constraints, and discrimination. World-renowned researchers synthesize research on race and ethnicity, explain how demographics will affect leisure behavior in the 21st century, and explain the leisure behavior of minorities. presents an international perspective, delving into the leisure behaviors of minority groups in Europe, Australia, New Zealand, and East Asia. Race, Ethnicity, and Leisure examines the current theories and practices related to minority leisure and reviews numerous issues related to these diverse groups’ leisure, including needs and motivations, constraints, and discrimination. The authors consider leisure behavior of ethnic and racial groups, investigating issues such as types of recreation participation among specific groups, recreation in specific environments, and factors affecting participation. The book also suggests future directions in research and professional practice, guiding students and professionals in addressing the demographic changes in the U.S. and Canadian populations.